HE Masahiko Horie pinning the medal on Dr. Leong's suit lapel. Dr. Stephen Leong Mun Yoon, Director of UTAR Centre for International Studies, has been conferred "The Order of the Rising Sun, Gold Rays with Rosette" by the His Majesty the Emperor of Japan. 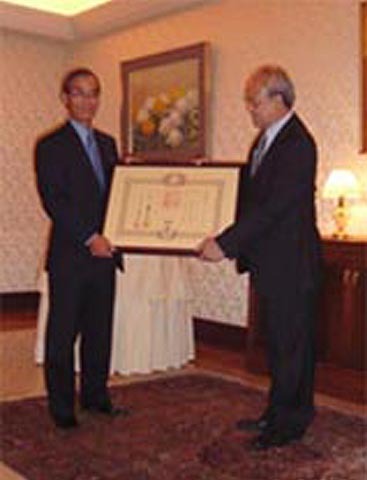 His Excellency Mr. Masahiko Horie, Japan's Ambassador to Malaysia, presented the award in a ceremony held at His Excellency's residence in Kuala Lumpur on 15 July 2009. Dr. Leong was honoured for his outstanding contribution to the promotion of mutual understanding and academic exchanges between Japan and Malaysia. "I am deeply honoured and humbled by this award and I accept it on behalf of all Malaysians. To be recognised by His Majesty the Emperor of Japan is truly a distinct honour and privilege. I had the unique experience and honour to have personally spoken to His Majesty the Emperor of Japan at an official reception held in honour of the Visit of Their Majesties the Emperor and Empress of Japan to Malaysia in 1991," Dr. Leong said. He further shared, "We have so much more to learn from Japan and I thank His Majesty the Emperor of Japan and the Government of Japan for this prestigious award." Dr. Leong added, "I also wish to thank all my students, colleagues, friends and family for all their support over the years." Dr. Leong joined UTAR in January of this year. Prior to this, he was Assistant Director- General at the Institute of Strategic and International Studies (ISIS) Malaysia (1995- 2008) and Director, Centre for Japan Studies at ISIS Malaysia (1992-2008)He further shared, "We have so much more to learn from Japan and I thank His Majesty the Emperor of Japan and the Government of Japan for this prestigious award." Dr. Leong added, "I also wish to thank all my students, colleagues, friends and family for all their support over the years.